"Cheers for today Maurice, putted really well today and shot 4 under and won the trophy today, all thanks to you." I just wanted to drop you a quick note to say thanks for the help and advice whilst choosing my new set of clubs. I'd also like to mention that joining the golf club is one of the best decisions I've made and I wish that I had done so years earlier. I have been made to feel very welcome by everyone in the pro shop, those that run the club and the playing members. Maurice, I have been waiting to write to you to ensure I don't find I have "talked too soon". Will fitted me for a putter several weeks ago now and I can safely say he did an excellent job. I am definitely holing my fair share and more from all distances. The odd bomb, mid range and 6 footers. Many thanks to you, Will and the Team. Great service. Great advice. "I would recommend Maurice to anyone looking for new clubs. With his fitting centre and huge expanse of knowledge I have a fantastic new set of irons, properly fitted for me and a very fair price. One thing I really did notice was that he explained why the specs were what they were which has installed so much confidence in my game and new clubs.Go and see him and get fitted.... It will help your game hugely.Plus the clubs arrived within 4 days!" Just played probably my best ever golf! Thanks Maurice! Also to be able to view my shots with various clubs arrowing down the centre of the 'on screen replica' fairway was a real treat !!! "That last lesson on my long game certainly worked - I shot a nett 67 in the Midweek Medal, even with 38 putts! So, you can see how well my drives and long fairway shots were going. I hit 11 of the 14 fairways and the other three were only in the first cut rough. I followed that up with another gross 81 in the Saturday Medal, nett 69 now that I am off 12!" "Maurice, I just wanted to say thank you for last week!!! Just got back from the EGU Champion club event at Scarcroft GC in Leeds where I finished on -5. Best I've driven the ball in years!!!" "Maurice has to be about the best coach in the region and his advice put me in good stead, particularly on the putting green." Ken Bailey recently came for a few lessons and a session with the FlightScope. Here is what he had to say, "I would like to say a big thank you! As you know, I was having problems with my driver when you said you would be able to help. So, I booked a lesson and came to see you. Without much hassle, you told me which driver would suit my game and, I must admit, the new driver, along with the new irons and metal woods you custom fitted for me, have transformed my game! The tips and information you gave me, made all the difference. Winning the Captain's Day 2013 was the highlight of my golf so far this year and it's all thanks to you! If anyone was ever to tell me they have a problem with their golf game, I will be sure to tell them 'See Maurice, he will most definitely be able to help you!'" David Hawkins - Club President and winner of the 2013 Invitation Day. "A fantastic day for the 48 players that played, our Course and amenities were praised by all our visiting friends. My special thanks to my partner, Les Tucker, from Millbrook. However, yet again I am indebted to Maurice for his tuition and club fitting, my PING Irons are great, but my new G25 Driver is just awesome!" Thanks for yet another good lesson yesterday and the information, I always feel so much better after my lessons! "Maurice has helped me so much with my golf. He has really helped me with my mind and my golf swing. Maurice's coaching is awesome, you simply can't beat it!" I must say I am really benefitting from these lessons. I can see a real difference in my golf this year (improvement of course!). Having 'drip feed' lessons every week keeps my golf ticking over and stops bad habits forming. So thanks. I started playing golf 40 years ago and for the first 12 years I was a keen and regular player. During the last few years I have attempted to play occasionally, with increasing lack of success until advancing age and an arm injury convinced me that I could not rely on my 'experience' and also that golf for over 60's is not the same as when a youngster! But I wanted to play and I was almost prepared to start again. A friend suggested that Maurice might be able to help and even though I am not a LBGC member I called him. And I am glad I did. Maurice did not actually start me from the beginning. True, he did suggest some changes and did point out some basic faults, but most importantly to me was his ability to encourage me to practice and to think about what I should be doing. His calm and quiet teaching style does seem to have changed my approach and preparation for a return to the golf course. After my first session of lessons with Maurice and after many hours and buckets of balls at the range, I am now about to return to club competitions. I realise that I will hit some bad shots but I feel more able to understand why and to remedy the errors. Maurice has given me some confidence and expectation that I am capable of hitting a good shot. Obviously the results and my handicap revisions will finally determine the success of his coaching, but I have signed up for some more and look forward to sharing my stories with Maurice in the future. He has set me on the path back and I am determined to enjoy my golf again! Many thanks. I have now played twice with the new Ping G25 driver and 5 wood purchased from you. These are great clubs - just what I needed for the new season. I will never buy a club again without being fitted by an expert like your good self! I just wanted to let you know how pleased I am with my new driver. I have just played in my first medal round at our new Club and came in nett level par with a gross 87, having managed to make 8 pars - mostly thanks to the extra distance (and confidence) I achieved with my drives. I am so pleased that we checked out what would suit me best with the launch monitor and that I didn't just blindly buy a new driver. Now I can't wait to play again - which is just how you should feel about golf!!! I thought it was about time I dropped you a line to thank you for the great work you did on fitting me with my new clubs last September. I have really noticed the difference in my ball striking, which has improved greatly. I did not realize how much difference it makes compared to buying straight off the shelf and I will definitely will recommend this to all my friends. Also, thank you to all of your team members for the great, friendly atmosphere that exists in the Pro Shop, it has been my pleasure to have enjoyed Will's company out on the golf course on a couple of occasions and hope in the near future to also enjoy your and Freddie's company too. I have been playing golf on and off for 30 years and always a 15 ish handicap. I had lessons at Woburn and David Leadbetter academy - still 15 handicap. I then had a few lessons with Maurice and was custom fitted. I went down to a 13 handicap. I went on your first Spain trip and came down to a 10 Handicap. I hurt my back and you gave me a 10 point test and recommended I see Diana O'Reilly at St Judes physiotherapy. My back is better and you have helped me change my swing to help protect my back. Now I have been on another great trip to Spain with and I am looking forward to more fun and improvement. I have been on a number of golf breaks and some including coaching - the Islantilla trip was the best by far. The 'atmosphere' within the group not only made for a brilliant relaxing break but the interest was kept going at all times because of the superb coaching and tips. Maurice has a knack of just giving the right amount of input, for the maximum output and that meant the intensity of learning was down to the individual. The location was great - the facilities for golf, the hotel and the outstanding food added to the general enjoyment. Would I go again - absolutely! The Maurice Campbell trip to Islantilla combines first class tuition virtually on a one-to-one basis with an opportunity to practice those improvements on a challenging golf course. This is the second time I have been and I learnt so much more than the first time. Maurice is an excellent teacher quick to observe where improvements can be made and always it seems able to come up with the right solution. He is also a great guy to spend time with. Maurice has really straightened me out. I now have the confidence to go for shots I just could not make in the past. Maurice has helped me so much with my golf. He has really helped me with my mind and my golf swing. Maurice's coaching is awesome, you simply can't beat it. Maurice's Flightscope certainly is an impressive piece of technology. 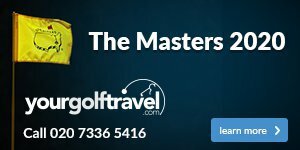 It gives you feedback on a myriad of information that includes shot path from tee to green, angle of attack, club head speed, side spin on the ball and classification of each effort from draw to dreaded slice. It adds an extra dimension to lessons and is ideal when comparing the performance of new clubs with what's already in your bag. Is that new club everyone's talking about really better than the one you've already got or is the problem more to do with what's happening at the other end? The FlightScope will tell you everything you need to know. By the time I went to see Maurice I had completely lost confidence in every part of my game. I wasn't particularly enjoying golf anymore and was often beaten before I stood on the 1st tee. Time on the practise ground didn't work, I just practised my faults and endangered the lives of people walking through Sandy Lane. Having a series of lessons with Maurice has been brilliant and has really helped me get my confidence and passion for golf back. He has great knowledge on all aspects of the game, communicates in a way even I can understand and is always following up on how I am doing. My one regret is I didn't do it sooner. Thanks for yet another good lesson yesterday and the information, I always feel so much better after my lessons. Just a quick email to thank you for your help with my short game and my new irons over the last week. I lowered my lifetime best by 3 strokes this morning and shot my first ever sub par round. I'll be on a high all weekend. Thanks for your help in achieving this in such a short timescale, I'm really appreciative. "Thanks for all of your help Maurice, I am just doing what you have told me." - Winning the Herts Alliance Pro Am. I hope you had a good day yesterday, I sure did. I played in a 4 ball with captian Hawkins, I shot a gross 75 to beat him by 1 !! I parred all except 1,2,9 & 12, I had 16 2 puts and 2 1 puts. I shaved the hole 4 times and was only short (outside 1 foot) 3 times, but no 3 puts. Thanks for the lesson it helped emensly, not only on the greens but also the rest of my game. Recently I was looking for a driver to gain more distance. 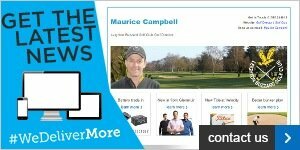 I had already had one go on Maurice's FlightScope launch monitor and I was extremely impressed with all the information it gave me to help my game. I booked another session with Maurice to find the right driver. With Maurice's help I have found a driver that goes further. I was impressed at how accurate the information was as when I took the driver out onto the course, it went the distance the FlightScope said it would go. I have also tried a 4 wood and 7 wood and it told me if they filled the gaps in my set. The FlightScope gave me the information to make the right choices. It was great. I have had lessons off Maurice for 9 years and in that time I have found him to be really helpful and accommodating. He has a huge amount of knowledge and he makes things easy for me to understand. When I have needed him, he has always been there. I would call Maurice from the States when I had a problem with my golf and he always helped me. He is the first person I speak to when I have a problem and I know I can trust what he has to say." I have used the FlightScope launch monitor before and found it great. I used it previously to help me determine that a 3 wood is better for me than a driver. I also recently used it because I wanted to get a new 5 wood to replace my old one. I tried the new 5 wood out and it just was not happening. It was not going any further than my old one. Maurice suggested I try a 7 wood. I thought he was joking but when I hit the 7 wood it flew further than both my old 5 wood and the new 5 wood I was trying. Maurice explained it was all to do with my golf swing and that I need more lofted clubs for the ball to go further. I could not disagree as the FlightScope was showing me the results. On the golf course it has been a revelation. I could never get over the big Oak tree on our 7th hole with my old 5 wood, but with my new 7 wood I can clear that tree comfortably. I would not have naturally chosen a 7 wood but with Maurice's help and the information from the FlightScope launch monitor it became the obvious choice! The drill you suggested for me to do with the shaft through the belt really helped with my swing as my upper and lower body sequencing as it was quite uncoordinated before. I'm feeling pretty confident with my game at the moment, barely hitting a shot offline and shaping the ball pretty good. I feel I am close to playing some really good golf. Now lost 3 shots since I bought the Bushnell range finder from you in August!! Thanks a lot!! Seriously, it's made a big difference as I carry 4 wedges including sand wedge and its between 60 yards and 130 yards where it really helps. PS Only problem now is realistically I'm a 12 handicapper having to play off 7!! My partners Tarby and Heighway are not amused as big betterball matches around the corner! I don't know if it was just the 1" shorter shaft or that I had spent extra time stretching my back (funnily enough before I saw your e-mail about strecthing) but yesterday with the new driver was amazing. I used it on 7 holes and 6 were superb both in terms of length (so much for your 10 yard challenge - these were 20 yards longer!) but also lovely gentle draws. Even the "poor" drive was dead straight and nearly made the ridge on the 5th, it was just that I caught it a bit thin. I can't believe how much difference it made with a 20 grams lighter shaft - many thanks for your expert fitting service. I followed on with 29 putts which I can only put down to your tip re the dominant eye in your news letter last week. End result was I won the money and paid for a fair chunk of the new driver !! Thank you for the stretching and video clips. Thank you for helping me understand my swing issues and helping me to improve. I really enjoyed my lessons, feeling comfortable, relaxed and focused in your company. I understand quite clearly the issues I have to work through and hope the next time we meet for a lesson you see a significant improvement. I feel I have the understanding and knowledge to improve my ball striking consistency, hard work and focus is what's needed from me to cement the learning. I hope to see you soon as a member of Leighton Buzzard golf club and I would not hesitate in recommending you to others for guidance. My golf had been going downhill for a couple of months until you pointed out that I was not rotating my hips enough. Now my game is really sexed up! Seriously though, when self-help doesn't work, it's great to have someone with your knowledge and ability to spot what we're doing wrong on hand to help. I'm starting to enjoy the confounded game again. Thank you very much for the golf lesson you gave me. I have nade notes on the key points of the lesson and I expect to be pratcising what you taught me quite soon. Thank you for measuring me up for the PINGG15's and once again for the excellent lesson! I look forward to seeing you later in the year when my wife come along to play your course. You will recall the putting lesson we had when I was home last month. The difference is incredible. Short putts are no longer an issue and whilst in this game nothing is for ever, the improvement is better than I could have expected. After being afraid to putt from 2 feet, the change is remarkable!! Yesterday I introduced it to my longer putts. The strike and feel is so much more consistent and I knocked in 2 from 20 feet. Maurice is an amazing teacher and mentor, who has helped me achieve my goals and was with me every step of the way. He makes things very clear for me to understand and is also flexible in his approach, I trust him completely with my swing. I love having lessons from him because I know I am getting the best information and most of all I have fun while I am learning. I owe a lot to Maurice, he is not just an amazing coach he's also a great person who helped me jump the biggest hurdle in golf the mental game." Just a quick thank you note. My practice after my lesson today - bunker play, chipping and iron play - went really well. The two basic tips seemed to transform things. I will work on this going forward and expect to see my game improve significantly. We'll see but right now I feel very positive about it all. "Today I have learnt the most about driving than I have learnt in my golfing life. Thank you for your help"